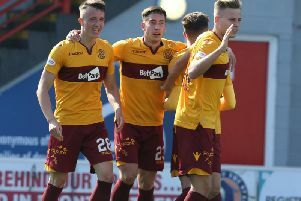 After going two goals up against Rangers with early goals by Curtis Main (penalty) and Allan Campbell, Motherwell at a raucous Fir Park for the Saturday luchtime kick-off. An astonishing start to the match saw Motherwell two goals up within the first 15 minutes. Strike number one with seven minutes on the clock saw Main slot home a penalty after a foul on Chris Cadden by Russell Martin. The Steelmen - given vociferous backing by the Well Bois throughout - were two up when Main dispossessed Russell Martin and played through Campbell who slotted past Wes Foderingham. It was an unbelievable start to the match, considering that Motherwell's previous league win over Rangers had come way back in December 2002 - 39 games previously. Rangers at last began to come into the game and ex-Motherwell man Jamie Murphy stung keeper Trevor Carson's hands with a low shot. Alfredo Morelos then had an effort deflected wide off Cedric Kipre, before the hosts almost went three up when Campbell played in Cadden whose right footer skimmed the top of the Rangers bar. A big handball shout for a penalty against Motherwell defender Charles Dunne was dismissed by referee Nick Walsh on the half hour, with the next action coming at the other end when Campbell bore down on goal before having his shot blocked by Martin, with Main soon showing great improvisation to loft a left footed attempt over Fotheringham but just wide of the far post on 40 minutes. After producing a fabulous opening half, the Steelmen had a nightmare start to the second period and it was 2-2 within nine minutes. First of all, James Tavernier netted a penalty after Frear had been adjudged to have fouled the Rangers right back, although at first glance the award appeared harsh. Within just three minutes it was 2-2 when Murphy produced a fine run and shot into the corner from outside the area. Main then hit the bar after a brilliant run and shot, before blasting a free-kick over the bar from the edge of the box after Cadden had been felled. Main was having another outstanding match for Motherwell but there was a rare error from him on 64 minutes when he gave the ball away to Josh Windass and he played in Daniel Candeias whose shot was brilliantly blocked by Carson. Both teams continued to showed tremendous effort in th eremaining 20 minutes but there was no further scoring. Motherwell: Carson, Tait, Cadden, McHugh, Main, Frear (Hendrie 57), Bowman (Petravicius 83), Dunne, Aldred, Kipré, Campbell.